The commodification of Broadway continues apace with the arrival of SpongeBob SquarePants. Here we have another popular TV and film title being turned into a big, splashy musical spectacular. Even with Frozen, Harry Potter and Mean Girls still to come this season, the underwater world of SpongeBob is the weirdest of them all. But there’s an intriguing juxtaposition between the trippy, hippy, hallucinogenic fantasy land in which the musical is set in and the happy family show it’s setting out to be. Playwright Kyle Jarrow, who has written the book, has dubbed the show “Our Town meets Armageddon meets SpongeBob.” Tina Landau’s production is an ambitiously apocalyptic story of a community under existential threat from an underwater volcano that could wipe them out. 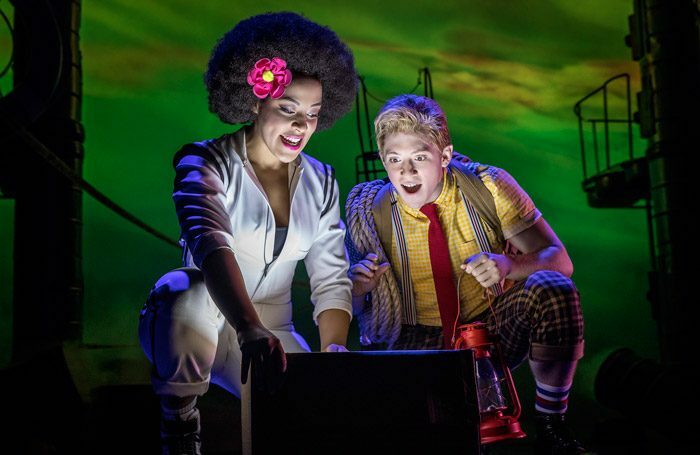 It’s a story that chimes perfectly with our times, while also the basis of a bright, eager-to-please cartoon of a show, a riot of primary colours and catchy tunes – not to mention the streamers and confetti that rain down on the audience. The score is a mash-up of original songs commissioned from pop names like Cyndi Lauper, John Legend, Panic! at the Disco, Sara Bareilles and the Plain White Ts, with older songs from David Bowie and Brian Eno, Tom Kenny and Andy Paley. This mix gives it plenty of contemporary culture credibility, but doesn’t give the show a defining musical voice. Landau similarly throws everything at the staging from juggling and cycling to tap dance and skateboarding that makes it feel deliberately chaotic but also a bit relentless. The costumes do more heavy lifting for character identification than the actors, though you’d have to take it on trust that Ethan Slater is SpongeBob. Gavin Lee has a more goofy comic presence as Squidward, the octopus co-worker of SpongeBob at the Krusty Krab.